Standing in the middle of an icy trail on a bright December day, Tom Stephenson sweeps an H-shaped antenna overhead, searching for something he already knows is there. Through the blizzard of static on his handheld speaker, faint beeps confirm that a herd of bighorn sheep wearing telemetry collars hides somewhere in this valley on the eastern edge of California’s Sierra Nevada. But spotting the buff-colored ungulates can be tricky. “There’s an element of luck to it,” says Stephenson, an environmental scientist with the California Department of Fish and Wildlife. A rangy man with graying blond hair, he squints through binoculars at a craggy slope draped in morning shadows and snow. It’s a challenging backdrop even for Stephenson, who leads the Sierra Nevada Bighorn Sheep Recovery Program. Like other bighorn populations across the West, Sierra bighorn were nearly wiped out after European settlers arrived in California, bringing domestic sheep that introduced virulent diseases. By the mid-1990s, scarcely more than 100 bighorn remained — just 10 percent of historic estimates. So the state launched the recovery program in a desperate bid to save this unique subspecies. “There they are!” Stephenson says, handing me the binoculars and switching to a long scope. He counts 11 bighorn grazing at the base of a cliff — six ewes, two rams and three stub-horned lambs. By 2016, thanks to the efforts of Stephenson’s team and a run of favorable weather, the bighorn population had soared to roughly 600 animals living in 14 herds scattered across the range. The bighorn’s recovery has been a remarkable success, but it’s come at a price. Ranchers in the Eastern Sierra have lost access to certain pastures, as managers cleared away domestic sheep to prevent another disease outbreak. 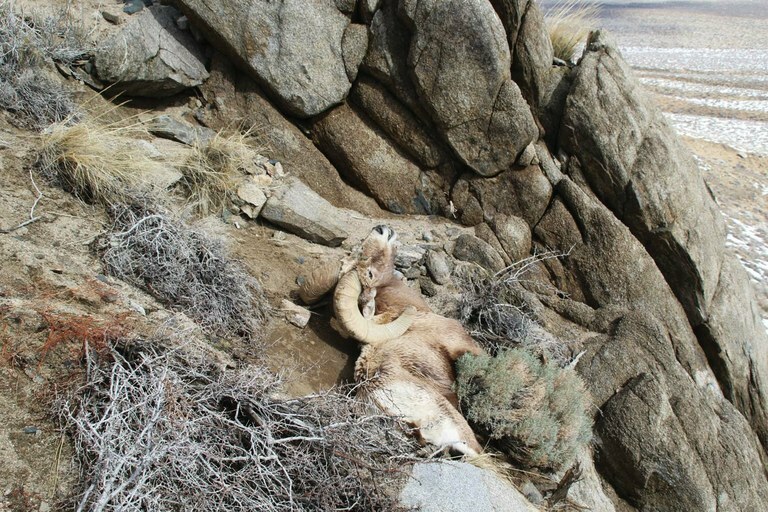 Two dozen mountain lions lost their lives, too. Healthy bighorn populations can handle natural levels of predation from mountain lions, their primary predator. 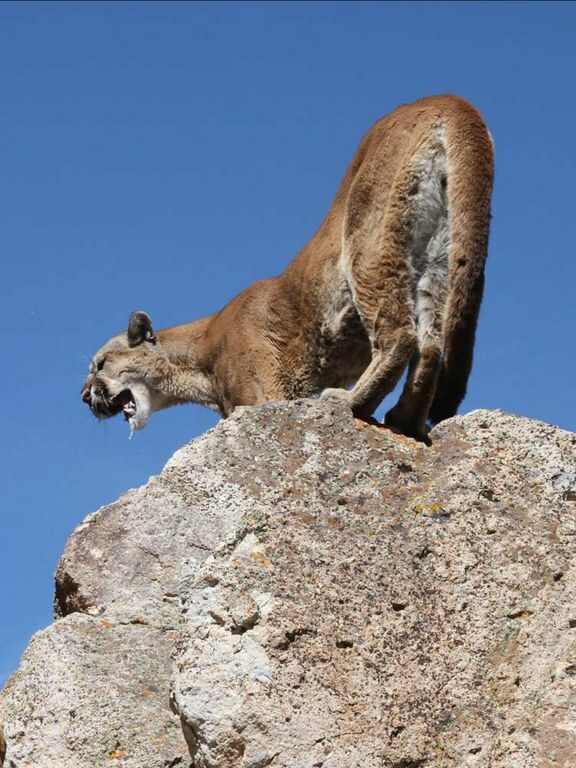 But studies show that cougars can decimate struggling herds, like those in the Sierra. Managers often target the big cats when vulnerable bighorn populations can no longer withstand even minor losses. The answer, at least in the Sierra Nevada, is sadly familiar: Centuries of human impacts have left no simple solutions to ensure the sheep’s recovery. Those who want to see bighorn and big cats coexist again must reckon with the legacies of past wrongs while trying not to commit new ones — no easy task. A Sierra bighorn sheep, radio collared and tagged, before being released in the Eastern Sierra Nevada. Thirty miles southeast of where Stephenson and I spotted the bighorn, a modest building sits on the outskirts of Bishop, California. John Wehausen, thin and bespectacled, leads me there on cattle-worn trails through the sagebrush scrub. He swings open the door to reveal heaps of salvaged scientific equipment and tables brimming with paper lunch bags full of lamb manure. This is where Wehausen analyzes bighorn DNA, including what he extracts from these Grape-Nut-sized pellets. “It’s the only genetics lab with a wood-burning stove,” he jokes. Wehausen started studying Sierra bighorn in the late 1970s as a graduate student at the University of Michigan. 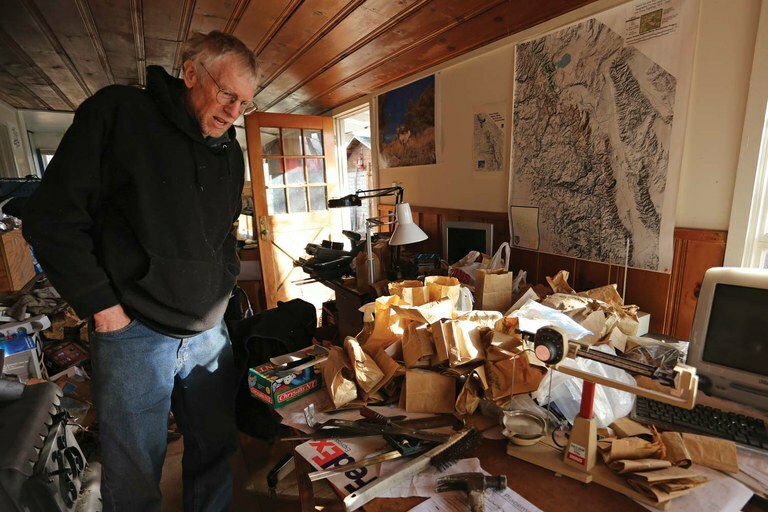 He’s now technically retired after spending decades at the University of California’s White Mountain Research Center, but he still helps with bighorn recovery, mostly for free. “It’s been my life’s work,” he says. And it’s been a rollercoaster. Mountain lions are one of the threats to the bighorn population, and some have been killed to protect them. When Wehausen conducted the first Sierra bighorn census, there were roughly 250 left. They were disease-free, so he helped convince the state to launch a restoration project. They would take sheep from two surviving populations in the remote Southern Sierra and begin re-establishing herds throughout the range. Wildlife managers wanted to use only native sheep, since Sierra bighorn differ genetically from their Rocky Mountain and desert kin. The effort started off well. Three new herds were seeded, including one on Wheeler Ridge, which is visible from Wehausen’s lab. Back then, he says, “I would have told you that we would have them back to all their historic range by the turn of the century.” But that’s not what happened. In the mid-1980s, the herds began to shrink, forcing the department to put translocations on hold. Over the previous decade, Wehausen had begun documenting more and more lion tracks and kills. He counted 49 bighorn killed by lions between 1977 and 1988, representing 70 percent of recorded deaths. Coming back from a long hike in Sawmill Canyon, he actually saw a cougar tackle a ewe on a rocky ledge. “One bound,” he recalls, “and it was on her.” Entire herds also stopped descending from the high country to graze in the low-elevation winter ranges they shared with mule deer, the lion’s primary prey. Wehausen believes the bighorn abandoned these areas because of increased cougar activity. And the loss of such a valuable food source only amplified the effects of direct predation on the herds. Wehausen suspects that predation increased because of an anomalous surge in lion numbers. Lions had begun to recover after California stopped offering bounties for killing them in 1963, and then, in 1972, imposed a moratorium on sport-hunting the animal. Along the Eastern Sierra, evidence suggests the lion population peaked in the 1980s, fed by an abundance of mule deer, which had benefited from irrigated agriculture and clear-cutting in their summer habitat across the mountains. “These dynamics were derived from all these past human influences,” Wehausen says, and bighorn got caught in between. Others believe that weather, not predation, drove the sudden bighorn decline. A drought began in 1987, the year the largest herd abandoned its winter range, and the valley never greened up. The mule deer population plummeted, and bighorn likely suffered, too, says California Department of Fish and Wildlife biologist Jeff Villepique, who studied Sierra bighorn for his doctorate in the 2000s. Bighorn are well suited to alpine life, he says, and they clung to the safety of the mountains because there was no food to lure them down and no heavy snow to push them out. In his research, Villepique also struggled to find evidence that lions had kept sheep away from their winter ranges. For instance, when Villepique tracked bighorn movements with GPS collars, he found that they actually seemed to prefer areas with more lions. The lions followed the deer, and the deer followed the choicest vegetation. Bighorn seemed willing to risk getting eaten to join the feast. These competing hypotheses echo a long-standing debate: whether predators control populations from the top down, or whether food controls them from the bottom up. The lack of a clear explanation in this case still bothers Vern Bleich, who ran the recovery program from its inception until 2008, when he retired and Stephenson took over. He wanted to understand how the sheep ended up in such a bind, but the answer proved elusive. “That has been a great disappointment to me,” he says. One way or another, the bighorn population plunged to its lowest point in 1995. Even if predation wasn’t the primary cause, managers felt it now posed a serious threat. There was little published science on this at the time, but studies from Alberta to the Mojave have since demonstrated that lions can depress or even extirpate small bighorn populations. Managers felt the best option was to kill lions. However, a 1990 California ballot measure had made the earlier moratorium on lion hunting permanent. Sheep advocates petitioned — successfully — to have Sierra bighorn protected under the federal Endangered Species Act in 1999. The new status gave managers the power to override state law, which the Legislature later amended anyway. And soon after listing, the state launched the recovery program with predator control as a central component. 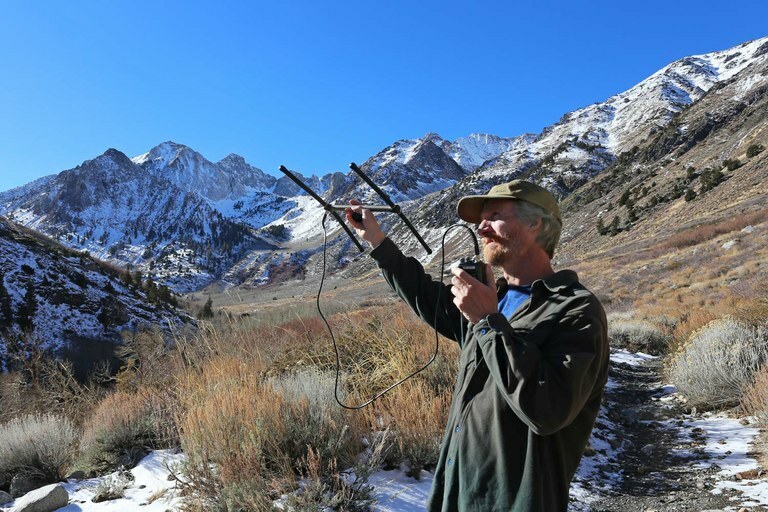 Tom Stephenson listens for a signal from radio-collared bighorn in McGee Creek Canyon this winter. The next fifteen years were kind to Sierra bighorn as managers forged ahead on the other aspects of the recovery program, shuffling sheep around to help populations grow. Using net guns and helicopters, they would move a ewe to boost a herd’s numbers, or relocate a ram to increase genetic diversity. A few adventurous bighorn split off, colonizing several new herds on their own, and starting in 2013, managers established the final four herds required for recovery. Meanwhile, managers worked to stamp out the risk of a disease outbreak by moving domestic sheep away from bighorn habitat. 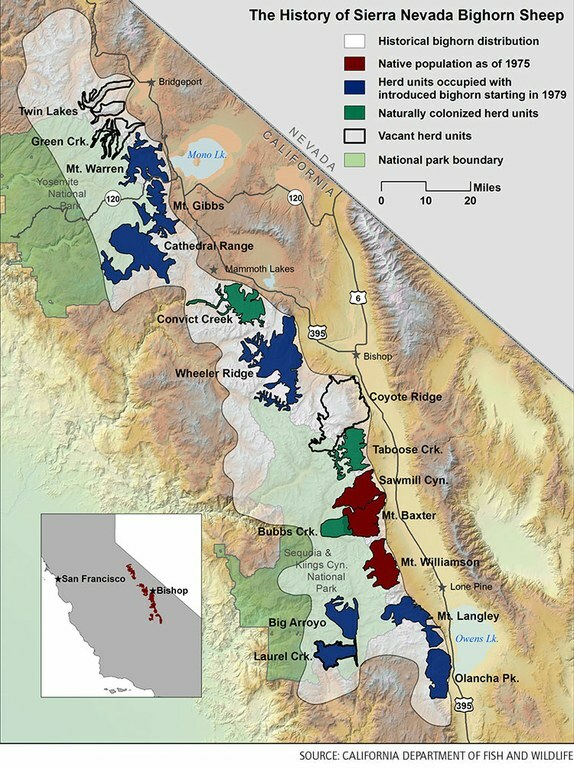 Though perhaps 1,000 sheep still graze in high-risk proximity to bighorn, thousands more were cleared off some 57,000 acres of pasture — mostly in the Inyo National Forest and on land owned by the Los Angeles Department of Water and Power. As a concession to ranchers, managers decided not to re-establish herds at the northern end of the range, where the most intense ranching still occurs. It began to seem possible to down-list the sheep from endangered to threatened by 2017, the official goal of the recovery plan. The final version of that plan was hammered out over eight years with input from a diverse group of stakeholders, and it also detailed when lions could be removed. The nonprofit Mountain Lion Foundation participated in the negotiations and acknowledged the need to kill lions, says Chris Papouchis, a conservation biologist who served as its representative. But the foundation insisted that managers take out only lions that threatened sheep. That would minimize the impact on lions, they argued, and perhaps also prove most effective at reducing predation. Lion populations can’t survive on bighorn alone, and many experts believe that only some cats specialize in sheep. 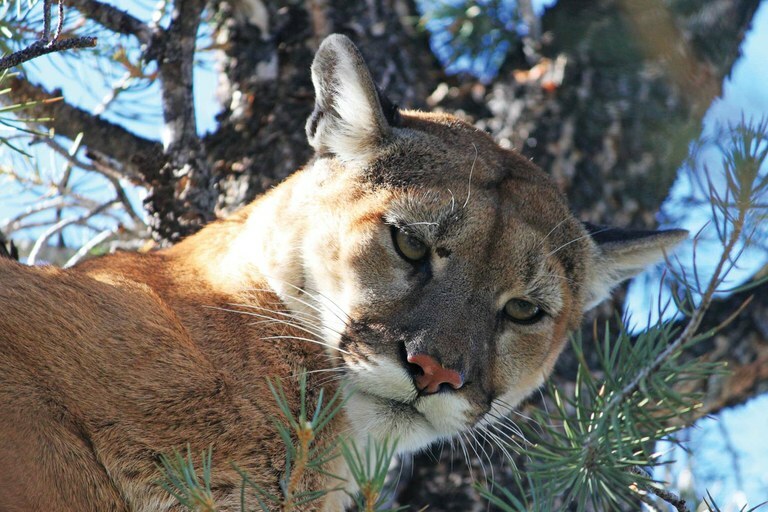 Villepique recalls one astonishingly long-lived cougar — it reached 18 in the wild — that regularly hung around bighorn, but appeared to dine only on mule deer. From a bighorn’s point of view, it was a “good” lion. And predator biologists say that removing a good lion simply makes room for a potential sheep-eater to move into town. Becky Pierce, the former predator biologist for the Sierra sheep recovery program, was especially worried about other lions straying into bighorn habitat from the surrounding wilderness. So Pierce’s team collared resident lions to find out exactly which cats were killing sheep and to track down the offenders. Under Stephenson’s direction, however, Pierce felt that the program became more aggressive and less discriminating. She accused Wildlife Services — the federal agency contracted to kill the lions — of doing its job inhumanely, and also illegally. She says that one orphaned litter of kittens was left to starve; another was mauled to death by a houndsman’s dogs. She also learned that government hunters had caught lions using snares, which she believed violated state law. “I’m not an animal-rights activist,” Pierce says, pointing out that she had authorized many removals herself, but the incidents still disturbed her. So she filed a complaint against Stephenson and the department with the California branch of the watchdog group Public Employees for Environmental Responsibility in 2010. Later that year, a state legislative counsel concluded that snares were indeed illegal, and soon after, the predator control program ended. Pierce, who no longer works on the project, also sued the department for defamation and retaliation for whistleblowing. That suit was settled out of court in September. Stephenson says that the program did ramp up lion removals under his watch, but only because of a troubling uptick in predation, especially in source herds used for translocations. Stephenson emphasizes that the department still targeted only “problem” lions, and that it was unclear that snares were illegal prior to the 2010 ruling. “We don’t have anything against lions,” Stephenson says. However, he had a clear mandate to restore bighorn. “Sierra sheep were the endangered animal and mountain lions are quite abundant in California,” he says. And the faster sheep recovered, the sooner the state could cease predator control altogether. John Wehausen in the lab where he analyzes bighorn DNA. Around the time Pierce filed her complaint, the Arizona Game and Fish Department began contemplating its own bighorn restoration project in a mountain range near Tucson. The Santa Catalinas rise above Tucson in muscular layers of igneous and metamorphic rock, and until the 1990s, they hosted a population of desert bighorn. The sheep’s disappearance remains mysterious, but bighorn advocates and state officials saw an opportunity to re-establish the herd after fires restored desert and forest habitat that had been overgrown by brush. Proponents expected that the effort would have to involve killing lions. The source herds couldn’t provide enough bighorn to re-establish a large population in one go, so the herd would be vulnerable at first. But the department also anticipated that would rile Tucson’s environmental community. Like many state wildlife agencies, the department had been criticized for managing predators with a heavy hand. Some say that stems from agencies’ allegiance to hunters, who often see predators as competition for deer, elk, and other game animals, and who provide a major source of funding through their purchase of hunting licenses. The resulting deal appeased everyone, including Quigley and the hardline Center for Biological Diversity, another environmental nonprofit. Predator control would be temporary and surgical. 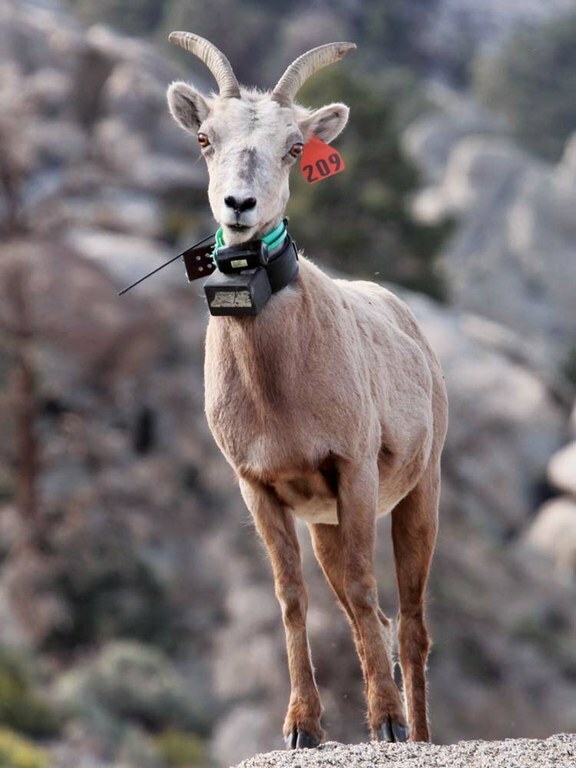 Nearly every bighorn released into the Santa Catalinas would wear an expensive GPS collar, and government scientists would follow up on sheep deaths immediately and report them to the public. If a lion had been responsible, a houndsman would track and kill it. Still, the reintroduction has served as something of a Rorschach test. Dolan notes that, because of the punishing terrain, the houndsman couldn’t catch every lion that killed sheep. To him, that suggests predator control may have been unnecessary. To others, however, the challenge of catching lions underscores the need to remove some animals beforehand. “You’re going to end up taking that lion anyhow, you might as well take it before you trade two or three or four sheep,” says Eric Rominger, a biologist who has worked on the California restoration effort and informally consulted on the Arizona project. Rominger, known for his ardent support of predator control and his Sam Elliott-style mustache, thinks bighorn need extra help where lions are “subsidized” by large populations of deer or livestock; lions subsist on these prey while opportunistically hunting bighorn to extinction. His own research suggests that range-wide lion control helped drive down predation on state-endangered bighorn in New Mexico and boost the population from less than 170 in 2001 to more than 1,000 today. A bighorn ram killed by this year’s harsh winter, which dropped more than 40 feet of snow in parts of the Sierra Nevada. Between the weather and a spike in predation by mountain lions, roughly 15 percent of the sheep population has perished. On a bluebird day in late January, Stephenson skis back into the valley we visited the previous month, this time on a grim mission: to investigate the deaths of three bighorn. He finds them in the creek, their broad-set eyes and coarse fur preserved by the frigid water. He suspects they died of hypothermia when they couldn’t scale the 6-foot-tall snow bank on the far shore. These are just a few casualties of what has been a brutal winter for Sierra bighorn. More than 40 feet of snow has fallen in places, and Stephenson says the animals struggled to move around and find food. On top of that, predation has spiked again in one of the main herds used for translocations. Two lions killed 12 ewes, out of a population of 50. “That’s beyond the point where we get concerned,” Stephenson says. It’s a devastating double-whammy. “If it was just one or the other, it would be serious, but it would be that much easier to try to manage,” Stephenson says. At least 91 sheep have died — roughly 15 percent of the total population. Just a few months ago, the bighorn’s recovery seemed imminent. The number of breeding females had grown close to threshold for down-listing, and managers had recently won a hard-fought battle to vacate one of the last grazing leases next to occupied bighorn habitat — a plot of county land near Yosemite. In December, Stephenson had told me that the bighorn were doing well enough to handle some predation. But this year’s losses will almost certainly put off down-listing the animal. With luck, Stephenson says, “we might only be looking at a delay of another two or three years.” Otherwise, managers will have to step in again. Stephenson says all options are back on the table, including removing lions. In a tragic twist, an act of nature may drag them back into the crosshairs again. A mountain lion that shares habitat with bighorn sheep in the Eastern Sierra Nevada of California. Note: This story has been updated to correct the composition of the Santa Catalina Mountains. They are composed mostly of igneous and metamorphic rock, not sedimentary. An error about the origin of the sheep; they did not come from a captive-breeding facility, but instead from a herd in Yuma, Arizona. Julia Rosen is a freelance journalist based in Portland, Oregon. Her work has appeared in Nature, Orion, the Los Angeles Times and many other places.